I do not collect flash units, I do not collect flash units, I do not collect flash units. This will not turn out like my light meter collection, No no no. But I have a bunch of them anyway. With a couple of exceptions, they came with cameras I bought as part of a package. The worst ones (namely the pee-shooters with high trigger voltages) got tossed; but as with most accessories I can't bear to throw the decent ones away. 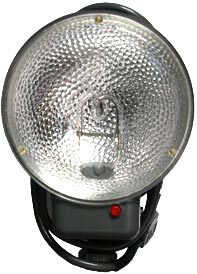 Note on nomenclature: some people make a distinction between flash and strobe, with the latter meaning electronic flash, as opposed to bulbs. I believe the distinction is still important in the UK and elsewhere, but in the U.S. most people use the word flash regardless of type, especially since bulbs are pretty much gone except for special applications. 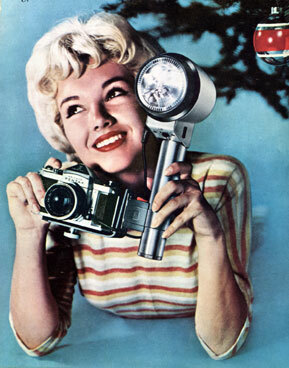 Terms such as speedlight (which also meant electronic flash, or strobe), speed gun, and the like, are archaic except as part of a manufacturer's model name (like Nikon's Speedlights or Canon's Speedlites). Personally I'm not interested in nit-picking the names of these things. Guide numbers are in feet at ISO 100 at 35mm coverage unless otherwise noted. Lens coverage refers to the angle of view of a lens of a specified focal length when mounted on a full-frame, 35mm camera. Type: I distinguish between three main mounts: Camera-mount means the unit was designed to fit directly into the camera. e.g. the Argus C3 unit. Handle mount means the flash sits on a handle and is (usually) attached to the camera via a bracket and synched via a cable (e.g. : the photo of the Honeywell/Heiland girl above). Shoe mount means the unit was designed to fit into a camera's accessory shoe. Hot Shoe compatible: since "hot shoes" are proprietary and are not compatible between camera makes or many models, this tells which cameras the flash hot shoe was designed to fit. A hot shoe means that the flash syncs with the camera through contacts on the shoe. A cold shoe means that it simply holds the flash in place and the sync is done via a cord attached elsewhere. The Canon Professional Network has a very nice explanation of which later Canon Speedlites can be used on which EOS bodies (albiet with European model designations). Trigger voltage is the electricity (in volts) that the flash puts out through its sync cord or foot. The flash sends out an electrical current and waits for the circuit to be completed (i.e. for the current to come back again); when the circuit is closed, the electrical current returns to the flash and that tells the unit to fire. Voltages vary depending on the manufacturer and model. 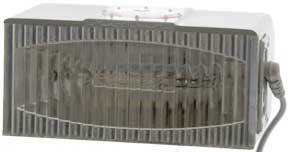 Older units tend to put out high voltages, modern units tend to put out low voltages. Older cameras didn't really care what the voltage was, but newer, electronic cameras do: you can fry the electronics in a camera by running high voltage through the flash circuit. Supposedly, very new and high-end cameras have protections against this, but it's still best to be careful, especially with expensive equipment. For more on trigger voltages, read this website. 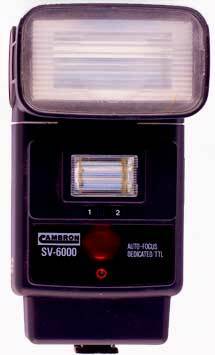 I got three flashes to go with my Canon AV-1: a Cambron SV-6000, a Vivitar 283, and this unit, of which I know the least. My guess is that it probably came as part of a kit along with a Canon Rebel. Cambron is or was the house brand for Cambridge Camera Exchange in New York. They bought from a variety of sources so I have no idea who actually made it; I do have an ad from the August 1989 issue of Popular Photography, so I know it sold for $120. Should be a nice flash: it's got bounce and swing. But mine has the back panel pried off to expose the screws, and it appears it's been worked on. There's no way I'm putting this on any camera I own. Might work as a slave, though. The standard little party popper. It was the next size up from the 133A, which took two AAs and was slim. 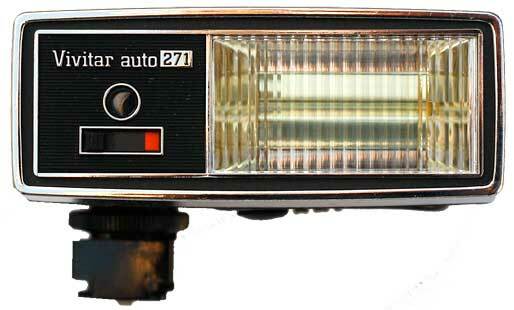 Like all the A-series flashes, it was high enough off axis that you didn't get red-eye. This was a gift from my parents, and was my first "real" flash unit to go on my first "real" camera, a Canon AE-1. A really nice flash. It has a good mix of power and bounce, but it has two big problems. The first is that the foot is relatively weak on it; there are a lot of 199As that are perfectly good except for a broken foot. I once bought a bag of 199A parts for almost nothing—it was great—it had everything except feet. The other problem is that it lacks the ability to reduce the power manually. 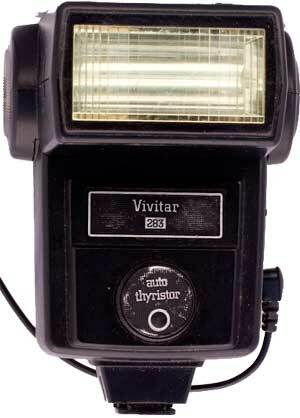 If it did, this could have been like the venerable Vivitar 283. This was Canon's Big Bertha for a long time. It was handle-mount, so you had to either use the PC sync or their special shoe-adapter cord. The shoe-adapter let you stretch out a little bit off camera, but not as much as one might have liked. If I'd used this more, I would probably have cut the cord and made an extension for it. I don't know why they didn't put the batteries inside the handle—they sit in a purse-like bag instead which you have to wear around your neck. Looks like the Tricorder from Star Trek. The battery pack was set up so that you could have several packs loaded and ready to go and swap them out quickly when the batteries went dry; great if you shooting like crazy and couldn't spare the time to reload six C batteries in the usual method. This was an updating of Canon's 177A, their mid-sized, non-bounce unit. This makes good use of the T-series advanced electronics, but sacrifices bounce capability. This one came out with the Canon T90, and offered TTL metering, whereas previous designs measured light from a sensor on the flash-body only. This is a very nice unit; it's got an adjustable hood so you can change the horizontal coverage from 24mm up to 85mm without having to deal with adapters, and there's a row of LEDs on the back that tell you which position you're set for as well. Also has bounce, high and low power, and is the first Canon flash to handle 2nd-curtain sync. It works in automatic with the T series and some EOS film cameras, but only runs at manual on a digital EOS, which knocks it back about 40 years into the pre-thyristor days when everything ran full-out every time (though in fairness, you can run it in a low-power, albiet manual, mode). 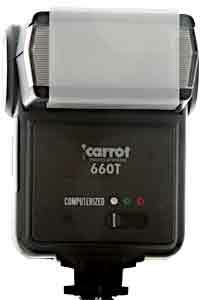 This flash premeired with the Canon EOS 620 and 650 cameras, and works with many other EOS film bodies. It's got this weird, swept-forward look that I haven't seen on anything else. No bounce capability but a decent guide number. Finally, a truly modern flash, and all the good and bad that comes with it. It has both bounce and swivel, and has an infra-red focus assist beam for dark-ambient situations. It can also work as a remote slave if you have a Canon 580EX II as the master. This one came the way most of my off-brand flashes have: in a box of junk with other stuff, and the batteries were left in and leaked, so I had a helluva time cleaning it up. Yet all it really did was foul the contacts, so with fresh batteries it still works. This is actually a pretty decent flash, at least in theory. It's got a thyrister circuit, three modes, a nice, easy to read calculator slide rule on the back, and it syncs via the hot shoe. It's got bounce and a nice little clip-on diffuser attachment to soften the light. Plus it's got a pretty good guide number in a fairly small package. It even uses the same sync cord connector as my Canon A-series flashes, so I can hook this beast up to the modular extension cord I made. The bad part: the trigger voltage is around 130v, which threatens to fry a lot of camera electronics. That means I'm limited to cameras from the 70s and earlier—and I still wouldn't put it on any of my Canon A series cameras, and I'd be hesitant to put it on my Canon EF as well. So this one may never make it out of an accessories box; or it may get pitched entirely. Or it might make a good slave. 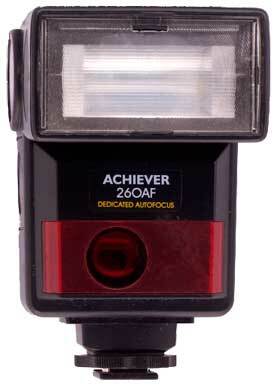 This is an early shoe-mount flash. All it has is a foot to hold it on the camera's accessory shoe, and then you have to plug the cord into the camera's X terminal to synchronize it. It fires at full power every time, so you don't get the advantage of saving battery power if you don't need it. On the other hand, you do get an effective shutter speed of 1/2000th, which is great for stopping motion. It also has an AC adapter so you can plug into the wall and save your batteries. This is another good candidate to run as a slave. This came with a camera a friend gave to me when she retired it. I haven't tried it so I can't comment much on it. A gift from Miguel, who sent it along with a light meter. This one is similar to the Viceroy above, but it has a thyristor circuit on the front so you can shoot it on two power-saving modes or run it flat out on manual. What makes this unique (for my collection) is that the batteries are non-replacable internal Ni-Cads. You charge the unit up via the AC cord, then disconnect and start shooting. If you run out of juice, you're stuck. These things are well regarded and remembered even today. When they were new in the 1980s I wanted one so much, but couldn't afford one. By the time I could, I had enough quality flashes that I couldn't justify this one. I kept hoping it would show up with a thrift-shop camera I'd bought; it finally did, but it's been a long time coming. Ken Rockwell said the PC cord is captive so they're usually still on these. It's not exactly captive, but there's a barb on the end that keeps it snapped in. Mine also comes with a Canon hot-shoe adapter cord (with a separate socket on the flash); that cord's socket end to the flash has been torn off. Just as well since I have no intention of sticking this on any of my modern cameras. This is, as the kids say, old school. It's hard to see here (you click on the image for a larger one) but there's a big old tube in it, and that's quite the reflector. The photo doesn't give it a proper sense of scale. It's about the size of a car's round headlamp. Like my Canon 577G above, it comes with a separate power supply that you have to sling over your shoulder. The upside is that it's made to take batteries or plug into various household currents, both in the USA (120v at 60hz) and Europe (up to 240v @ 50hz). The result is a serious amount of light.
] ©opyright by James Ollinger. All Rights Reserved.